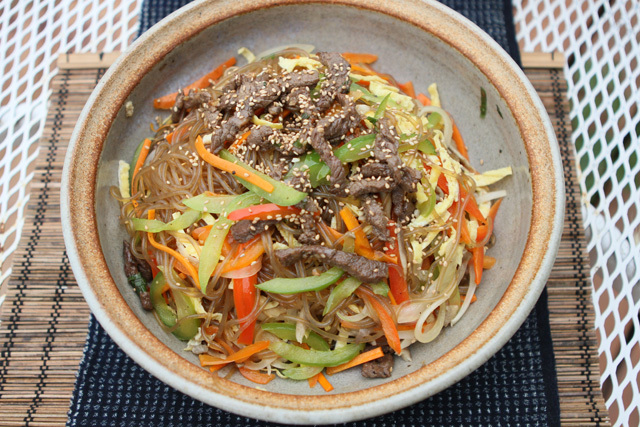 Japchae is one of the more well known Korean dishes and we've had quite a few requests for this dish, so here it is. 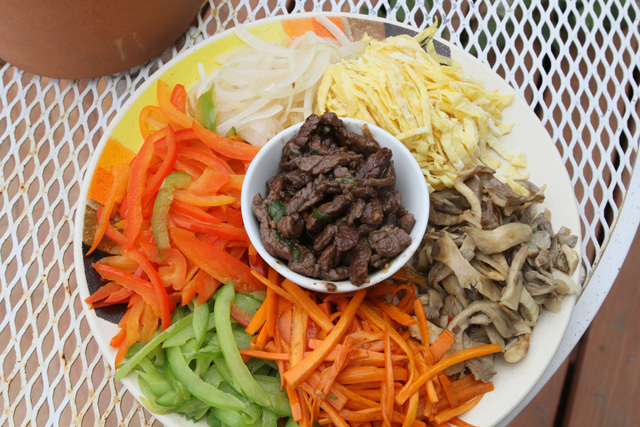 Japchae is not really an everyday dish because it takes a while to make and requires a bit of work. It's usually made in big batches and that's why our moms used to make this dish on holidays or birthdays. Relatives would come early to help with the preparations and the women would all be in the kitchen cooking and gossiping for hours. It took us over an hour but was actually really fun to make because we were cooking together and we knew there would be loads of leftovers to take home and share. * Usually spinach is used. (We just couldn't get any that day.) Just trim and blanche one bunch of spinach and season with 1t sesame oil and some salt. Doesn't need to be stir fried. 1. 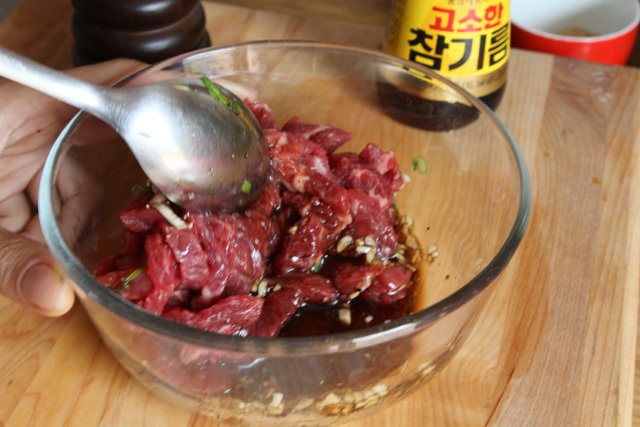 In a small bowl mix the marinade ingredients with the beef and set aside. 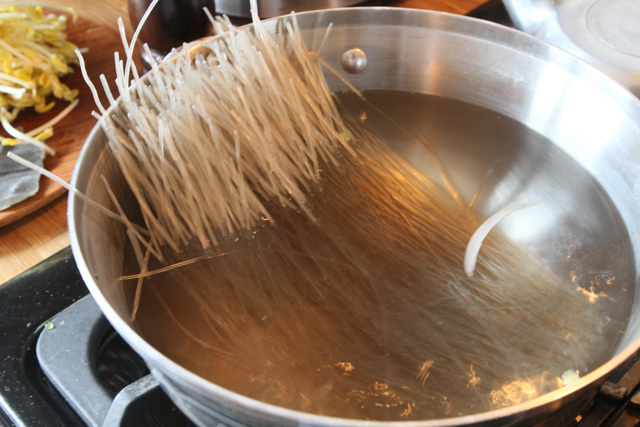 Put a pot of water on high heat to boil the noodles. 2. In a large frying pan heat up some oil and pour in the eggs. Season with salt and pepper. 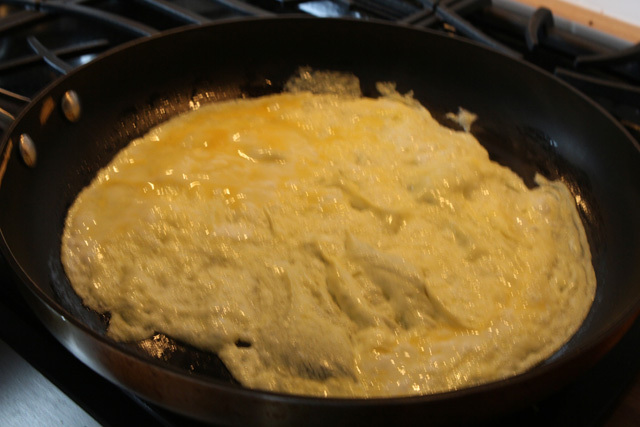 Flip after a minute to make a thin sheet of fried egg. Cool on a plate, then cut into matchsticks. Set aside. 3. 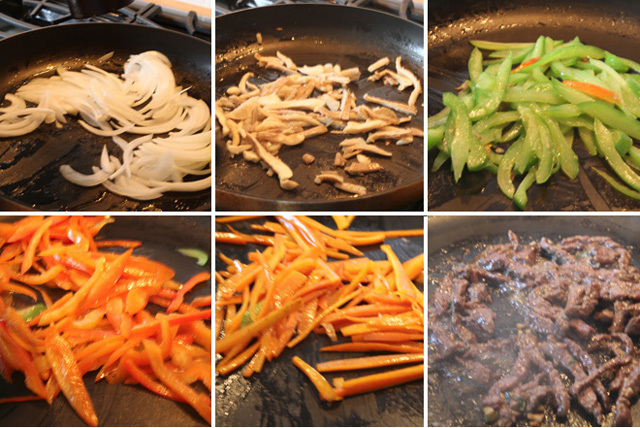 In the same pan stir fry the onions, mushrooms, green bell pepper, red bell pepper, carrot, then meat in that order with the vegetable oil and season with salt. The ingredients must be stir fried separately to keep the flavors in tact. And the order of frying should be from the lightest color to the darkest. 4. Set aside with the egg. 5. In a pot of boiling water add the glass noodles. Let cook for 8 minutes. Put in a colander and run under cold water to prevent overcooking. Drain thoroughly. 6. 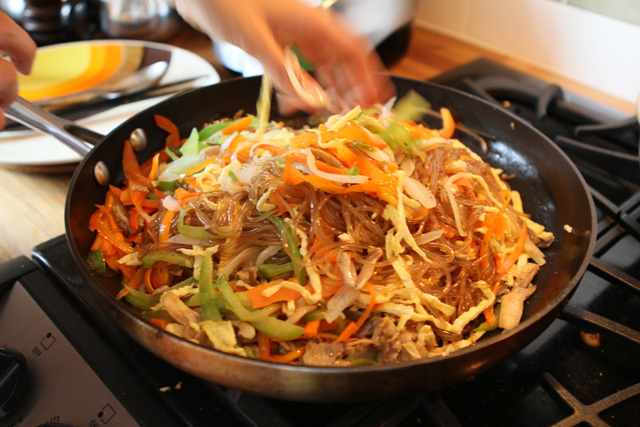 In the same frying pan heat up the sesame oil and add the drained noodles. The oil helps prevent the noodles from getting soggy. Mix around then add the soy sauce and sugar. If the noodles seem wet and slippery just let it sit in the pan for a little bit until all the moisture is gone and the noodles are more sticky than slippery. It should taste more salty than usual because the stir fried ingredients will balance out the taste. If it's still bland add a little more soy sauce. 7. Turn the heat off. Add the stir fried ingredients and mix it all up with your hands. Taste one more time and season with salt and pepper if needed. 8. Put in a serving bowl and sprinkle with sesame seeds. And you're done! It's perfect for a pot luck or dinner party. You will be surprised at how fast this huge bowl disappears. I know what I'll be having for dinner tomorrow night! Will be great for having friends over for this weekend. I'm enjoying this blog so much! All the recipes I've tried so far have turned out so much better than my poor attempts at guessing (which always results in a weird, vaguely "Asian"-tasting, barely edible mess). This looks amazing, can't wait to try it! Thanks for sharing! i'm definitely trying this one, it looks amazing! thanks for the recipe. my mother-in-law invited her friends over to prepare this wonderful dish. girls night out for them. making my grocery list and trying it this weekend. thanks. This looks so good. I'm definitely making this for dinner soon. Thank you so much for this blog. I've been reading it from the start and only now commented, but everything---the stories behind the food, the photos, the simplicity of the recipes---is top-notch. Can't wait to see what's next! 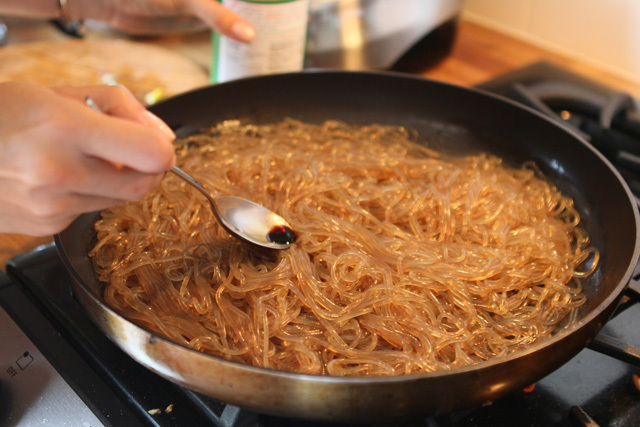 ooh, this reminds me of a filipino dish called pancit.. cant wait to try this. looks yummy <3 thanks for the recipe! have a nice weekend. I tried it! I tried it! I veganized it but it's good! what a beautiful dish. will give it a try as soon as i have a bit more time! this looks incredible every step of the way. I love all the veggies. This is amazing! I have always wanted to make this dish, as it is my personal fave! Quick question: how long does it take to make? I love glass noodle dishes, really looking forward to trying this out. discovered your blog today and i'm in love!!! Looks so delish! I have to try this at home! Love the photos! So happy to have found your blog! I can eat Korean food everyday. 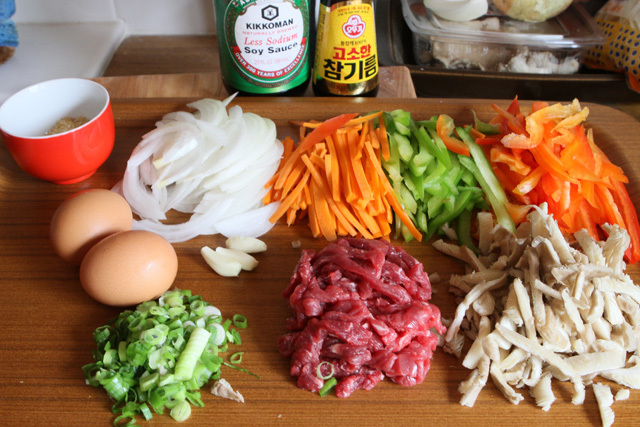 I always wanted to make Japchae, and now I certainly will.